Saint Andrew holds a special place for me, as he was the patron of the Roman Catholic College Seminary I attended for 4 years. Countless hours were spent praying before the image of this great saint, who was cradling an image of our seminary in his arms. This saint, who we deemed a brother, we would beg to intercede for the brothers of our house, for ourselves, and for an increase of vocations to the priesthood and to the religious life. Now, every year, I take it upon myself to pray a Novena to my brother, St. Andrew, for the state of the Church and the world. Our Gospel reading this morning presents us with the moment that Andrew and his brother Peter are called by Jesus for the great work of preaching the Gospel. Fishermen by trade, they were mending their nets by the edge of the sea, when this teacher walks by and says “Come after me, and I will make you fishers of men.” We are told that they immediately left their nets and followed Jesus, not knowing at all what was to come. In a retreat on this topic to seminarians, Bishop Robert Morlino the Roman Catholic Bishop of Madison, WI, once said “When the Lord and Savior of the world comes up to you, looks you in the eye, and says ‘Follow me,’ why in the world would you ever stand still?” Andrew and Peter felt the call of conviction that the Lord laid on their hearts and as we know became two of the great apostles, preaching the Good News of salvation to the death. There are times, I’d venture, that we often feel the call and conviction that Peter and Andrew felt, the call to preach the Gospel to all who will listen. We picture setting out on a grand crusade, bringing thousands to Christ and to salvation, bringing them home into the arms of God and away from the pain of heresy and death. But then we realize that with our busy lives in an increasingly secular world, we don’t have the time to go on these grand crusades that we have formulated in our mind. Notice what the Lord does with Peter & Andrew, and what He does with us as well. Jesus didn’t say, “Leave your nets, and you’re going to go on huge crusades.” No, he said, “Come follow me, and I will make you fishers of men.” Jesus took what they knew how to do, and enhanced it, for the work of ministry. So, too, does he do that with us. He takes our abilities, to teach, to pray, to work in the ordinariness of our lives, and enhances them for His uses, to preach the Gospel. That is how we can lead these lives of religious devotion in a secular and busy world. My friends, there is work to be done. The harvest is plentiful, and the labors are few. Pray for an increase in vocations to the priesthood, diaconate, and religious life, that the Lord may take people in their ordinariness and enhance their gifts to serve His glory, that we may build up the Kingdom of God together. Like Peter & Andrew, heed the conviction that He is placing on your heart. 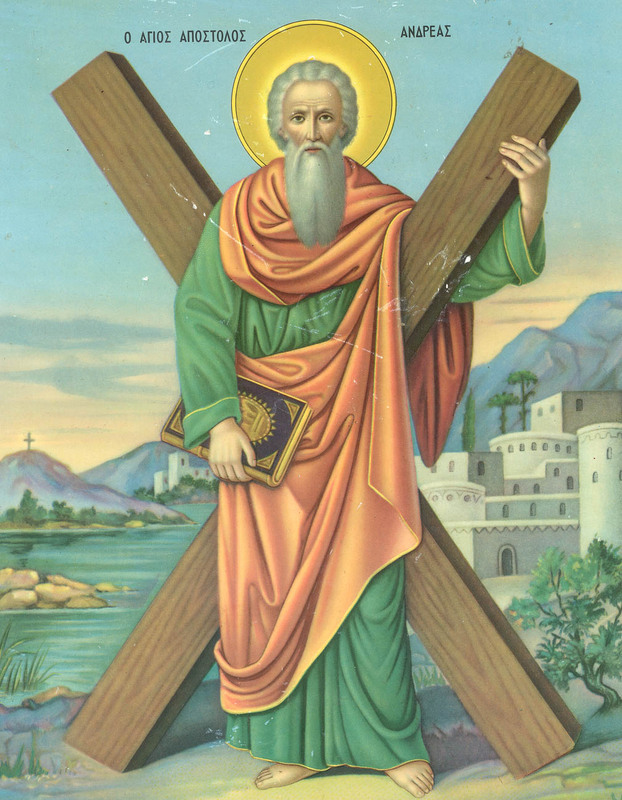 Saint Andrew, strong and powerful, intercede and pray for us. Andrew, apostle of Christ, help me to rejoice in Jesus and so bring others to Him. May my words and deeds lead others to deeper faith in him. Bold missionary and evangelist, guide me where the Lord would have me preach his gospel. Companion of the Lord Jesus, send us people called to be priests, deacons, & religious. Saint Andrew, in your kindness hear and answer our prayer.